How Greenpeace took the world to the Arctic and other lessons for using virtual reality in campaigns. Since the first mission to remote Amchitka, Alaska, in 1971, Greenpeace has heightened awareness by pushing the boundaries of reporting. Storytelling – and bringing people into the conversation about what’s at stake – is always evolving as technologies, cultural sensitivities, and the problems themselves shift. This summer, in keeping with this evolution and tradition of experimentation, Greenpeace launched A Journey to the Arctic. The project was the organisation’s first virtual reality (VR) campaign about the rapid and devastating impact of climate change in the Arctic. Using new technology – not to mention an expensive and uncharted one that asks viewers to wear silly masks that can cause motion sickness – is always a leap of faith. How did Greenpeace pull this campaign off and what can we learn? A Journey to the Arctic is a 3.5 minute virtual reality film that brings viewers face to face with the impacts of climate change. A Journey to the Arctic depicts the sublime beauty of Northern Svalbard, (a pristine Norwegian archipelago) immersing us within the beautiful, remote, and yet integrally important arctic region that has become increasingly fragile due to human-related climate change. With a VR-viewer strapped to your face and your head swirling around to explore, you begin your journey in front of the Arctic Sunrise as it breaks its way through ice to Svalbard. A Journey to the Arctic Slowly takes viewers deep inside of a glacier to hints of all the wildlife hidden within the snow and ice. You even see a mother polar bear with a cub, curiously investigating the camera – or rather six GoPro cameras for 360 degree video. Bringing people from around the world to the frontlines of climate change is critical, especially as Arctic ice melt accelerates. Yet doing so without further damaging the environment requires a mediated experience. Rasmus Törnqvist, the project’s Director of Photography, chose VR for its power to transport people and elicit emotional responses. 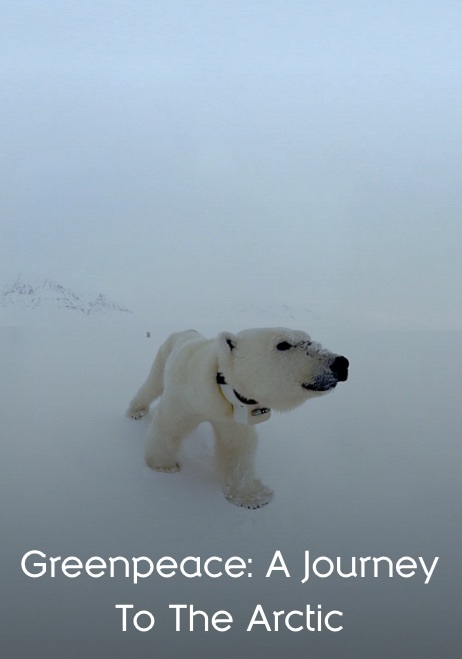 Törnqvist, who began working for Greenpeace as a campaigner 11 years ago, told us that VR “provides a unique opportunity to take millions of people to the arctic,” calling it Ecotourism 2.0. The VR experience is still too new for definitive results, Törnqvist says, but initial findings are promising. A Journey to the Arctic was created with face-to-face campaigning in mind. The film may be viewed anywhere but at 3.5 minutes it was made to test how VR works with campaigners and fundraisers on the street. When people on the street see the VR video, “most of the time they’re amazed and ready to support,” said Törnqvist. In some instances, campaigners have credited VR for more than doubling donations. Törnqvist hopes that within a few more months of campaigning, they will have provable stats to see just how effective this new technology is for Greenpeace. This positive response mirrors results found by Stanford University’s Virtual Human Interaction Lab. The Lab’s former Hardware Manager, Cody Karutz, told us by email that several studies show VR can nourish empathy and, more importantly, behavior change, in relation to the environment. One study showed a relationship between immersive video and reductions in hot water use. Two other studies found that VR can be used to give people an animal’s perspective and thereby create greater feelings of connection between the self and nature. Karutz told us that A Journey to the Arctic “gives the user enough time to accommodate to the Arctic spaces.” However, he says, “the piece is still focused on showcasing an exotic space.” This helps reduce one’s psychological distance from the issue, which is important. But bringing the issue home to the user’s local reality is integral to the work’s success. The campaigner, the human handing the viewer the VR goggles, needs to frame the story and give the user a hook integral part of the piece. Ainsley Sutherland, a fellow at BuzzFeed Open Lab who studied VR and empathy while at MIT, has also been critical of efforts to cast empathy creation as the most important aspect of virtual reality. Sutherland wrote that VR “cannot reproduce internal states, only the physical conditions that might influence that.” There are hundreds of relational factors, such as where you use VR, how it is presented to the user, and by whom the story is framed that can create, hinder, or alter the emotional connection between the VR environment and the viewer. Contexts (and campaigners) frame the story. 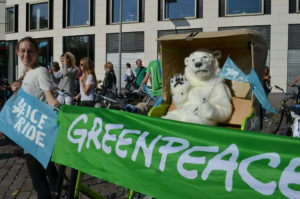 Greenpeace’s Törnqvist notes the continued primary and powerful role of the campaigner – and campaign. Greenpeace found that the setting in which the VR is shared influences the user experience. On a crowded street, few people will agree to sit and wear awkward headgear. Those that do have a less immersive experience than users at festivals or other locations. Törnqvist attributed this to a more relaxed, convivial setting. The quality of the VR experience matters, but context can make or break the VR as well. Törnqvist tells us that anyone who says they know how to make great VR films is either lying or from the future. However, he and others have some important lessons based on countless hours of filming. In largely stationary shots that allow the viewer to control where they look, building a didactical narrative is less effective. Place as story. 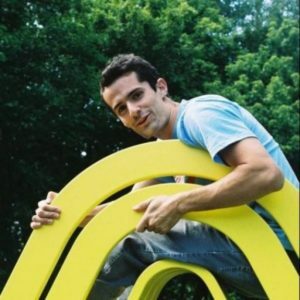 Evan Wexler, Technical Director and Cinematographer for On the Brink of Famine, talks about the key value of VR is building an experience of the site itself. Wexler calls this “place as story.” We see this in A Journey to the Arctic when the narrator invites us upon arrival to Svalbard to simply “just look around.” Wexler and Törnqvist both note that it’s important to find the right location at which to focus the viewer’s attention – the place where their presence may have a transformative effect. Positive emotions are more powerful. Törnqvist also found that positive emotions tend to create more powerful experiences. He sought Svalbard as an environment still largely untouched by humans in order to “offer the same awe and passion that we [at Greenpeace] feel about the planet.” The media shows what sublime landscape is at stake, not what is already lost. Create depth. Wexler and Törnqvist also discussed the importance and challenge of creating depth. 360 degree stationary camera rigs do not offer a large depth of field. Have the key subject nearby and other objects of value at middle and far distances to create a richer environment. This obviously presented some challenges in Svalbard, a land largely comprised of snow. Where’s the audience? The empathy and impact of any communications medium depends on the reader or viewer. In his TED talk, Chris Milk points out the importance of connecting his film for the United Nations, Clouds Over Sidra, to those with the power to make a difference. A scene of the Zaatari Refugee Camp from Clouds Over Sidra. The UN screened Milk’s film about Sidra, a 12-year-old Syrian girl in the Zaatari Refugee Camp, at the World Economic Forum’s meeting in Davos, Switzerland. It’s useful for campaigns to consider how and where their targeted audiences will view VR stories. 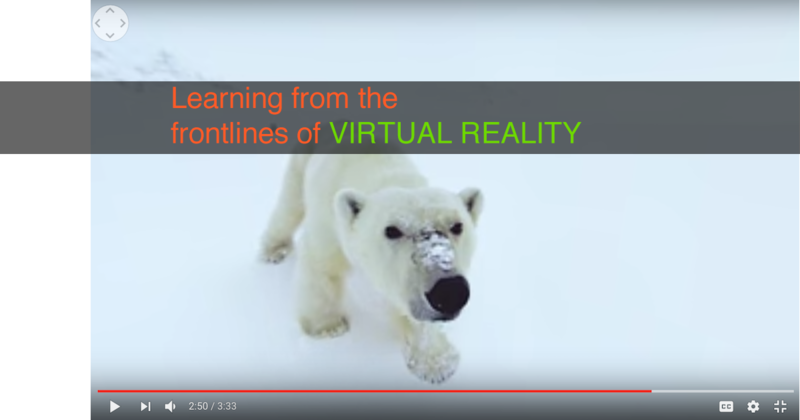 Karutz notes that there is a great lack of interaction in most VR video, including A Journey to the Arctic. Without“embodied engagement with the user and the VR environment,” Karutz says, there could be less lasting behavior change. This can be mediated by the campaigners but Greenpeace is already working on pushing VR even further. Pete Speller of Greenpeace International is working with The Feelies, a multi-sensory design team, and Alchemy VR, experts in creating compelling virtual reality narrative experiences, on a VR project that takes takes viewers inside Sawré Muybu village, home of the Munduruku Indigenous People in the Amazon rainforest. In the Tapajós project, as it’s called, multi-sensory viewing pods will complement the VR film to create an immersive experience incorporating sounds, imagery, motion, smell and touch. The goal is to create a deeper connection to the Munduruku people and Amazon rainforest. The work will be publicly launched in Rio de Janeiro in early 2017. “A fundamental of Greenpeace has always been the act of bearing witness,” Törnqvist told me. “Now, with VR, we have an opportunity for anyone to do so.” VR is a new way of telling stories but using it effectively requires a creative coupling with all the old tools campaigners have been honing for decades. Finding that balance remains the challenge.